The Thai Turkey Tacos from Miss Mommy were a great hit last week. We are definitely adding this to our favorites list. We also enjoyed, again, the Japanese Salad from that same post. I also made my Sausage and Bean Soup for the first time since moving to Scotland. Of coarse I can't find my recipe, so I had to recreate it from scratch. It turned out fairly well, so I posted the recipe last week. The new term at the University starts this week, so our lives are about to get very busy again. But it is so nice to have Darren home again after he was traveling so much the last two weeks. I love making homemade pizza...great for the picky eaters with various toppings. 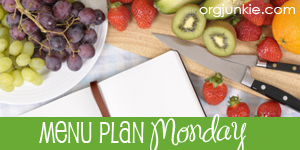 I'd be delighted if you'd stop by and share a meatless recipe today for Meatless Mondays. We'll be sharing Meatless Meals every week. You can see today's link-up HERE.